A good gaming desk is not just an ordinary desk that you need to walk down the road and purchase from a shop across the street. You need to consider several aspects before you settle on which type you will take home. Sadly, because of the urge to play their favorite video game, many people do not give a damn thought on what they sit on. However, they indeed feel a lot of pain on their bottoms as well as their backs after sometime. As if this is not enough to show them what they ought to do, they continue sitting their day after day. What though can you do? 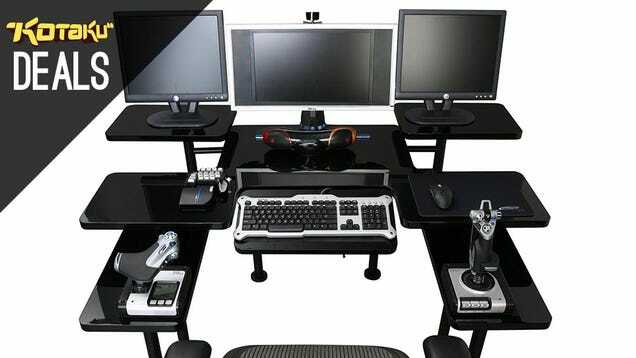 How will you be sure of the type of gaming desk to settle on? Here are 5 affluent desks that you can comfortably select from. Your search has been simplified. All these are beautiful features that will give you ultimate comfort. However, it is as expensive as a brand new BMW 5 Series the equivalent of $44, 750. While most desks are made for gaming in general, this type is specially designed to give you ultimate pleasure when flying or racing. Besides, its price is considered by many as affordable. Among the notable features of this gaming desk is the ability to adjust the seat as well as recliner. It also comes with 3-motion actuators, and a 3-point seat among other specifications that you might find appealing. You will definitely love the idea that this gaming desk contains adjustable keyboard, steering wheel and joystick platform. These will accord you the experience you would never find otherwise at only $15, 000. LCD monitors (21-inch), your joysticks, keyboard, printer, multifunction panes, computer towers, and a variety of other accessories of your choice. All these features will cost you $379. The Ovei Capsule is perhaps the most expensive gaming desk so far. If you are wondering what this desk would look like, you are not alone. Many people who have not had a chance to have a feel of it share your fears. With the cost of $100, 000, you would expect that this desk will give you all the suitable functions that you will not get from other desks. The truth is you are guaranteed affluent gaming experience thanks to all in-built features that you have longed for. It is my sincere belief that you truly love racing games. If my beliefs are something to trust, then this is a gaming desk that you really need. With its special features, you are able to negotiate a sharp corner and still take an early lead, accelerate, spin, decelerate, and fishtail as you wind up your favorite video game. This type of gaming desk will give you the convenience while gaming with your friends for only $70, 000. However, there are critics who say that there are other online shops that you can actually get this desk at a relatively cheaper price tag of around $50, 000. Whether that is true or not, you are assured of the best gaming experience thanks to 401 Driving Simulator specifications.